The SR01E12 is a universal adapter, offering: Serial, I2C, SPI, GPIO and Analog input interfaces controllable over Ethernet. The LAN adapter offers a quick and easy way to add Ethernet networking functionality to your circuits. Implementing SR01E12 adapter into device completely offload Ethernet processing protocols from the system and reduce and simplify software development. With the SR01E12 adapter numerous circuits can be addressed via Network such as: Sensors, LCDs, LED segmented displays, IO-Expanders, Relays, AD/DA converters, Tone Generators, RAM, EEPROM, etc. Provided Library contains intuitive, interface orientated functions for easy software development. It offers also functions for managing IP and other network specific addresses and default pins purpose assignment. There is library support for Windows and Linux. 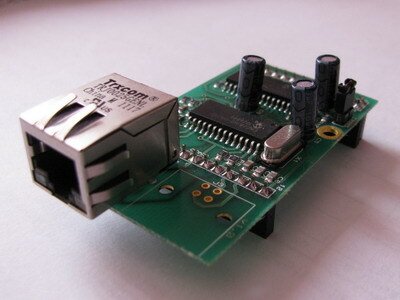 Lot of embedded boards like modems and diailers has a serial interface, also single chip computers are most easily controlled by their serial inputs. Widely used to setup complex ICs like DACs, ADCs, DSPs, Real time clocks, GPS receivers, Pressure sensors, Humidity sensors, Eeproms, Flash memories. Widely used to setup complex ICs like DACs, ADCs, DSPs, Microcontrollers, Eeproms, Flash memories. Can read data from various sources: Temperature sensors, Pressure sensors, Humidity sensors, Light sensors. Useful to register information provided by devices with pulse outputs: HAL sensors, rotations of a shaft, passes through a gate. Ship worldwide. Accept Bank Payment (wire transfer) and PayPal. To proceed fill the Inquiry Form.